I remember exactly where I was when I finished reading The Color Purple many years ago: on a Greyhound bus. Traveling to visit my nephew, I was engrossed by the book and so moved by the ending that I wept for several minutes, trying to hide my tears from other travelers. Now that I’ve seen this documentary of Walker’s life and accomplishments, I plan to re-read this and other books of hers and also catch up with those I haven’t read. Walker is an amazing woman in addition to being a wonderful writer of fiction, poetry and non-fiction. This beautiful movie was directed by British filmmaker Pratibha Pamar who is originally from Nairobi. Pamar’s 1993 movie Warrior Marks, was made in collaboration with Walker and they co-published a book based on that film. This film begins with Alice’s early life as a sharecropper’s daughter, her mother’s determination that all of her children be educated, and Alice’s very early proclivity toward writing. It would appear that Alice Walker may have invented the term “self-determination.” Her steadfastness in doing what she has needed to do throughout her life is a wonder to behold and an inspiration to women everywhere. 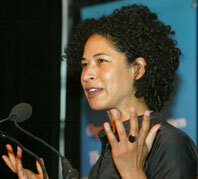 She has been criticized constantly for works she has produced, mostly because of the topics chosen – violence within Black families for example. But she is fearless in the pursuit of social justice via truth telling. Interviews with her ex-husband Mel Leventhal, writer/historian Howard Zinn, Angela Davis, Stephen Spielberg and several others, show us not only Walker’s fortitude but her lovely personality as well; their affection toward her spills out with their words. 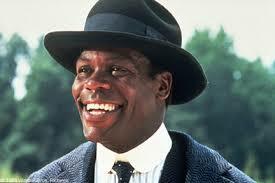 Danny Glover, who played “Mister,” a horrible man in Purple is clearly one of her biggest fans. Two of her brothers put in an appearance as well. 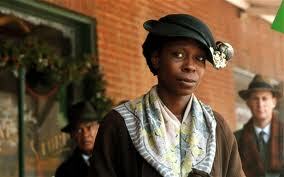 In The Color Purple Walker dealt with the violence within some Black families. In Possessing the Secret of Joy, she tackles female genital mutilation. She seems never to have hesitated to speak and write about social justice issues about which she cares, despite criticism. She has traveled to Gaza and took part in the “Gaza Flotilla” in 2009. Alice Walker is undaunted even as we see her serene and lovely in her California home surrounded by natural beauty. One can read a few thoughts of Walker’s about her daughter (and her objections to untrue Wikipedia statements) on her web site: http://alicewalkersgarden.com/2013/03/taking-care-of-the-truth-embedded-slander-a-meditation-on-the-complicity-of-wikipedia/ [Note: today there were only bare facts about her personal life on Wikipedia.] On the other hand, Rebecca hasn’t held back in her comments about her mother. See: http://www.dailymail.co.uk/femail/article-1021293/How-mothers-fanatical-feminist-views-tore-apart-daughter-The-Color-Purple-author.html This is one of those mysteries about famous people that will likely never be revealed and that is probably a good thing. 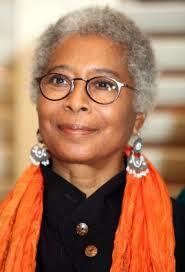 I admire Alice Walker for her discretion. In the film Gloria Steinem talks about how close Alice and Rebecca appeared to her during Rebecca’s teen years and expresses hope that they will reconcile. Walker has apparently had many lovers, including but not limited to Tracy Chapman. She talks about affairs with women in terms of “curiosity,” as in the urge to pursue her curiosity about making love with other women. Whatever. Personally I prefer passion. Once again, though, who Walker sleeps with and how and why is none of our business. What is our business is the good she has done in this world and continues to do, encouraging us to activism and thoughtfulness, with courage and determination.